"You know what the fellow said – in Italy, for thirty years under the Borgias, they had warfare, terror, murder and bloodshed, but they produced Michelangelo, Leonardo da Vinci and the Renaissance. In Switzerland, they had brotherly love, they had five hundred years of democracy and peace – and what did that produce? The cuckoo clock." --- Harry Lime, played by Orson Welles in Carol Reed's 1949 film "The Third Man"
June 28, 1914, when Austrian Archduke Franz Ferdinand and his wife Sophie were assassinated in Sarajevo, Bosnia-Herzegovina, a province of the Austro-Hungarian empire, is probably the one day in the 20th Century the outcome of which everybody would like to change. In a better world, Gavrilo Princip, the teen-age assassin, would fail and Franz Ferdinand -- the anointed successor to Emperor Franz Josef -- and Sophie would be unharmed. 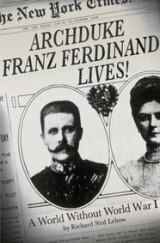 Political psychologist Richard Ned Lebow examines the chain of events that led to war in the summer of 1914 and what could have been done to prevent it in "Archduke Franz Ferdinand Lives!" (Palgrave MacMillan, 256 pages, suggested reading bibliography, index, $27.00). In the opinion of many historians -- and in my opinion -- even if the assassination had occurred there shouldn't have been a war that would eventually involve all of the world's great powers -- and many lesser ones -- that would claim nearly 40 million lives and set the stage for the next world war, the Holocaust and the Cold War. Germany didn't want to go to war, Russia was hardly in a position to fight after being defeated by Japan a decade earlier and France wasn't eager to engage Germany to get back its lost territory, Alsace-Lorraine. Britain, with a royal family related to both Germany's and Russia's, wasn't interested in going to war. Lebow presents two counterfactual worlds, the "best" outcome and the "worst" one. To some readers the best wouldn't be all that great, but it would have spared at least 100 million people, the Armenian massacre of WWI and the Holocaust of WWII, the two atomic bombs at Hiroshima and Nagasaki, and the madness of the two wars. In both scenarios, there would have been no Holocausts, no breakup of the multinational Austro-Hungarian empire (it would have become a federal state, modeled on the U.S. with Franz Ferdinand, who becomes emperor in 1916, at its head; for a description of this concept: http://en.wikipedia.org/wiki/United_States_of_Greater_Austria); no destruction of the Ottoman Empire, no Arab revolt led by T.E. Lawrence (of Arabia); no Israel and no enrichment of the U.S. by talented exiles of all kinds -- composers, conductors, architects like Ludwig Mies van der Rohe, no scientists like Albert Einstein and Edward Teller, no movie makers like Fritz Lang and Michael Curtiz, no writers like Thomas Mann, no artists -- from Europe. And there wouldn't have been a Harry Lime, a black marketeer in war torn Vienna right after WW II. The "worst" outcome would feature a Cold War -- between the German empire and Britain -- and a nuclear accident in 1972 that would wipe out London and Berlin, but spare the rest of the world. * Adolf Hitler would never fight in WWI and, after trying to be a painter but failing, becomes a successful entrepreneur of alternative "quack" medications. (Lebow points out that the real Hitler was interested in alternative medications). Hitler is not amused when people tell him he resembles the famous actor Charlie Chaplin. * Barack Obama never becomes president, but he is elected governor of Hawaii -- the most multicultural of U.S. states. (I would question whether Hawaii would have become a state in the extremely conservative U.S. of the scenario). * A Kennedy is elected president in 1960, but it's Jack Kennedy's older-by-two-years brother Joseph Patrick Kennedy Jr. -- "JPK". In real life, Joe Kennedy Jr. was an Army Air Corps pilot who was shot down in 1944 over the English Channel. The counterfactual JPK chooses JFK as his attorney general. The U.S. continues to have racial discrimination and "Gentlemen's Agreement" anti-Semitism well into the 1960s. Lebow notes that his own Jewish family was refused accommodations at a hotel in the 1950s, reminding me of a scene in Philip Roth's counterfactual novel "The Plot Against America". * Richard Nixon attends Harvard, serves two terms as a California congressman and becomes a traveling evangelist, like Billy Graham. The U.S., spared involvement in two world wars, is a conservative country, isolated in many ways from the rest of the world -- and for the better -- not intervening in every country's civil war! Absent the wars, there would have been no OSS and its successor, the CIA, which was involved in many coups. * Curt Flood integrates baseball, not Jackie Robinson, and it's not in the 1940s, but in the 1960s, when the Cleveland Indians draft him in 1962. * Louis "Satchmo" Armstrong, along with many other black musicians, goes to Europe in the 1920s and later and participates in a rich cultural scene in a much more accepting continent where black and white musicians routinely play together. Jazz combines with Jewish klezmer music to produce music that becomes popular in the U.S. as an import. (In real life, the very young and very poor Armstrong was virtually adopted by a Jewish couple in New Orleans, and always wore a Star of David medallion). * Winston Churchill becomes an advocate of greater freedom for India, which becomes a dominion like Canada. There is no departure from India by Pakistan, and the present-day Bangladesh remains a part of India. As both a history junkie and a fan of alternate/counterfactual history, I enjoyed "Archduke Franz Ferdiand Lives!" It's one of those books I wish were longer -- much longer. The insights Lebow presents in this book will expand your thinking and, to use that useful cliche´, push the envelope. Richard Ned Lebow is professor of International Political Theory in the Department of War Studies at King’s College London and James O. Freedman Presidential Professor Emeritus of Government at Dartmouth College. He is also a bye-fellow of Pembroke College at the University of Cambridge, and the author of almost 30 books. His work has been cited in The New York Times , The Wall Street Journal , and The Economist , and he has been interviewed on NPR, the BBC, CSPAN, and German, French, and Italian radio and television. Born in Paris in 1941 to parents who died in the Holocaust, he lives in London, England and Etna, New Hampshire.